There is a dining guide compendium in your room to cater for all types of food and budget. 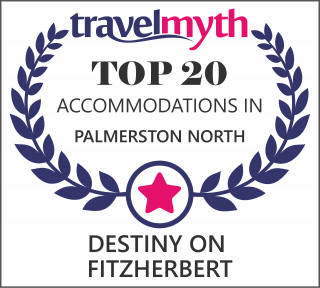 Call reception ext 800 if you would like to get our personal preferences to the amazing dining out options here in Palmerston North. Happy dining. The power in New Zealand is 240 volts AC50 cycles. Should you require an adaptor, please ask at reception. Please take time to make yourself familiar with the evacuation procedures in case of a fire. This is situated near the main entrance door to your room.